Learn Spanish in Oaxaca at our partner Spanish school Don Quijote. The school provides students with the opportunity to learn Spanish whilst being immersed in Mexican culture. Don Quijote's staff of Mexican Spanish teachers, provide effective teaching methods to help student’s to really maximise their learning capabilities during their Spanish course in Oaxaca. Our colorful partner school is located right in the center and very close to the main attractions. Its central patio is a beautiful common area in which the students gather to study together. The classes are full of natural light and the school has a restaurant on campus to take coffee between lessons or to enjoy a traditional Mexican lunch. The building is an example of 16th century colonial architecture. Located in the heart of Oaxaca's historical center, two blocks from the beautiful Santo Domingo ex-convent and 4 blocks from Oaxaca's "El Zocalo"
The minigroup programme with 20 or 25 lessons per week respectively consists of classes with a maximum of 8 students per teacher. The course is composed of three lessons of conversational grammar per day plus 1 or 3 lessons respectively of practical conversation and/or lectures. The course with 25 lessons per week consists of 20 lessons general Spanish lessons + 5 culture and conversation lessons. Double rooms can only be booked by two persons who are travelling together. Against a surcharge of € 28 per week you can book breakfast. Please indiciate this on the booking form. Stated price is for a transfer on arrival at airport Oaxaca. The school is closed on: 01/01/2019, 04/02/2019, 18/03/2019, 18/04/2019, 19/04/2019, 01/05/2019, 17/05/2019, 16/09/2019, 01/11/2019, 18/11/2019, 25/12/2019. Missed lessons due to bank holidays will not be refunded or rescheduled. If two holidays fall in the same week, one day will be made up and individual lessons will always be made up. The course Spanish and Salsa consists of 20 basic lessons of Spanish in a mini-group, along with 6 salsa classes per week (from 2019 on 5 salsa classes per week). The salsa classes take place at school, in groups of 8 - 12 students. For other Spanish & Dance courses, please click here. The course Spanish and cooking consists of 20 lessons Spanish a week in a mini-group and in addition 6 cooking lessons per week (in 2019 5 cooking lessons per week). 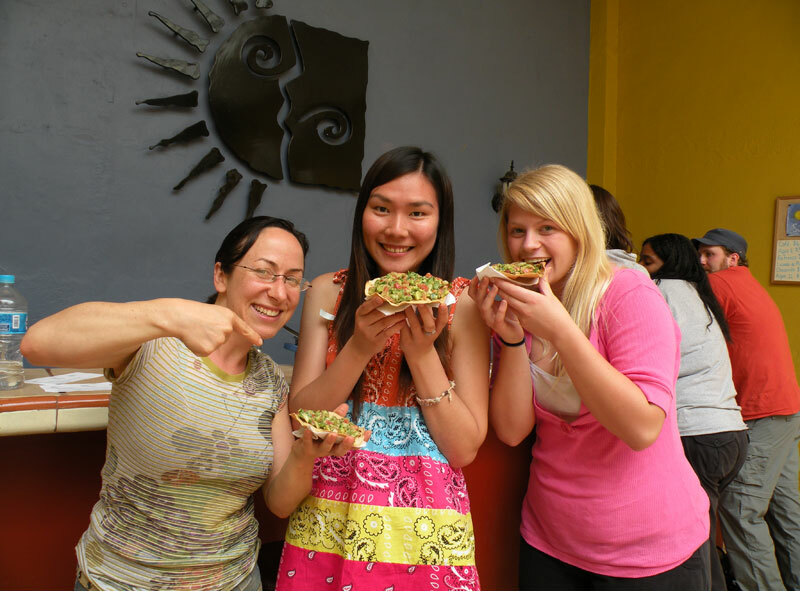 During the cooking classes you will prepare the most amazing Mexican dishes together with your fellow students. And of course, the meal must be tasted as well! You can participate in this course for 1 to 2 weeks. The one-to-one course is based on your linguistic skills, professional or social needs and personal expectations. Flexibility is the main feature of this course. As the only student in class you decide the content of the course being up to you. The one-to-one course is above all recommended for students with only a short amount of time available. 20 hours per week. The combined course combines group lessons with (semi)private lessons. You can choose between 25 lessons per week in total, consisting of 20 group lessons + 5 semi-private lessons with up to 4 students. Carefully selected host families provide a home away from home. This gives students the opportunity to further appreciate the beauty of Mexico and its people. You can stay in a host family in a single or double room, although the double room is only available for students who travel together. You can choose between breakfast only or halfboard. The Residence is located just three blocks from our partner school in a quaint, modern-Colonial house. You can choose to stay in an individual or double room, although the double room is only available for two students traveling together. The rooms are surrounded by large patios and garden areas where you can sunbathe or lounge. The house has a living area where students can watch TV or movies and a dining area for the buffet style, continental breakfast which you have to book in advance. You can also use the kitchen to prepare other meals or to save and warm up leftovers.